The 10 Best Places for Crab in North Carolina! Good seafood and North Carolina are practically synonymous. There is no better way to enjoy crab than fresh out of the water off the coast of North Carolina. Crab legs, crab meat, crab dip, or crab cake, there are plenty of fine places to dig in. Here are our favorite spots for crab in the state. 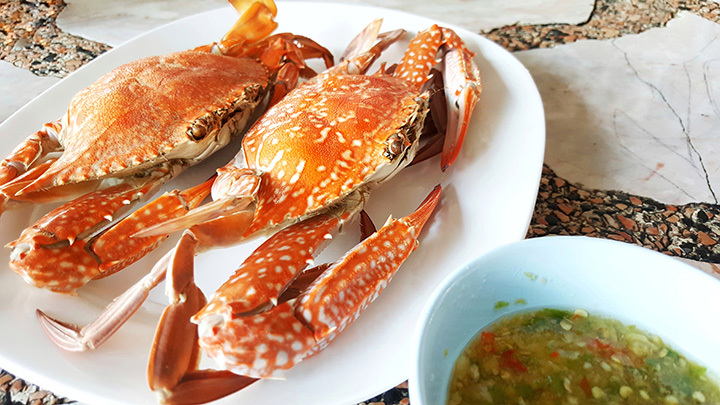 There are plenty of delightful local crab options at Fish Bites that will leave you full and satisfied. Try the steamed snow crab legs, local soft-shell crab platter broiled or fried, crab cakes loaded with crab and shrimp, or the local soft-shell crab sandwich lightly fried and topped with provolone. The best place in the county for seafood, the large menu is sure to be fulfilling to every guest. Post-beach trip or just a night out for dinner, Fish Bites is home to fresh crab options, as well as, incredible service. For some of the best seafood you have ever tasted, stop by the Waterfront Seafood Shack of Calabash. The soft-shell crab sandwich, crab cake, grilled or fried soft shell crab dinner—all dinners are served with French fries, coleslaw, and hushpuppies. Take a seat outside at the Waterfront and enjoy the best, freshest crab around. There are so many ways to incorporate crab into your meal at MJ’s Raw Bar & Grille. Start with a crab appetizer then dive right into the fresh dinner options. MJ’s crab stuffed mushrooms, crab cake, crab pretzel, crab fries, or MJ’s signature hot crab dip, anyone? Then grab an entrée that is served with your choice of hand-cut fries, homemade coleslaw, potato salad, sweet potato fries, salad, hushpuppies or the fresh fruit or veggie of the day. MJ’s signature crab cakes, crab cake sandwich, soft shell crab sandwich, and the crabby patty melt are all amazing options, too. Mr. P’s Bistro of Southport offers “cuisine of the lower Cape Fear.” Homemade Smith Island seafood okra gumbo will warm you right up with its tomato base and its hearty ingredients of shrimp, scallops, crab, and fish. To start the meal off, choose a crab-based appetizer from the hot backfin crab dip with warm French garlic bread and the amazing homemade shrimp and crab wontons. For dinner, dig into the Low Country Crab cakes, crab stuffed fish du jour, or from the several of dishes that include fresh crab meat. Are you more of a sandwich person? Try the awesome crab cake sandwich! Fried seafood, deviled crab or fresh in your soup, Pier 41 caters to every crab craving you may be having. If you prefer a warm, hearty soup, order the Seafood Gumbo that features celery, clams, crab, kielbasa, okra, onions, peppers, shrimp, and tomatoes. For a fried option, choose between the small, large, and deluxe seafood platter. The platters are each served with slaw, hushpuppies, and French fries or a baked potato. For a broiled option, try the fish stuffed with deviled crab, snow crab legs or the deluxe broiled platter—with or without oysters. Pier 41 seafood of Lumberton serves some of the best seafood in town, the food is amazing, and the staff is friendly. Crab balls or cold crab dip to start the meal? They’ve got it. Regardless of what you order, it’ll all be delicious, fresh, and dished up with excellent service. With nine locations in the state of North Carolina, two in South Carolina, and one in Maryland, the Shuckin’ Shack Oyster Bar of Cary is a must-try. If you are visiting the Outer Banks, this fine restaurant is one you don’t want to miss. The crab bisque, hot crab dip, crab cake, filet and crabmeat, filet, and crab cake, and more, the menu is chock full of delicious, filling options. The atmosphere of The Colington Café is delightful, and the staff members are top-notch at providing the best experience. Backfins Crabhouse of Wake Forest certainly knows their crab. If you are really hungry, don’t miss out on the crab cake or snow crab platters. The steam platter is full of red skin potatoes, corn, and a snow leg cluster, two blue crabs, shrimp, oysters, and clams. The incredible crab cake sandwich is on a bun with lettuce, tomato, and fries. Nothing pairs better with seafood than more seafood. The crab cake, snow leg cluster, and soft-shell crabs are also side options, so you can order on the side of your meal! Start with a delicious appetizer or soup at I Got Your Crabs of Kitty Hawk. The crab bisque is a creamy soup with plenty of crabmeat inside. The blue crab nachos feature house-made warm cheese, and blue crab meat, as well as tomatoes, red tomatoes, and chives. The crab cake sandwiches are amazing, and if sandwiches aren’t your style, there are also fried and steamed platter options to fill your belly. The softshell crab plate and the crab cake plate with blue crabmeat are both delicious. The steamed Dungeness crab, snow crab, and king crab legs are offered at the market price and are great options for your crab-loving heart as well. Cape Fear Seafood Company has several crab options that are crowd favorites. The crab dip and crab scampi risotto are incredible ways to start the evening off right. Then, dig into some Roasted red pepper & crab bisque, crab cake, and Alaskan snow crab legs. Between the great service and atmosphere and the amazing food, you can’t go wrong at one of the three Cape Fear Seafood Company locations in North Carolina.